Short run profit max for a perfectly competitive firm - FreeEconHelp.com, Learning Economics... Solved! We know that in the long run in a perfectly competitive market, economic profit should equal zero. This happens because firms are free to enter and exit the market. If there is positive economic profit, then firms will enter the market to make those economic profits until there is no economic profit left. Likewise, if there is negative economic profit, then firms will exit the market to take advantage of opportunities elsewhere until economic profit again equals zero. However, in the short run it is possible for a perfectly competitive firm to make a positive economic profit, an instructors will commonly ask where the profit maximizing point is. Another common question is to ask about changes in market, and how this will affect a perfectly competitive firm's profit. Marginal revenue (price from the market) is equal to marginal cost, which is equal to average total cost. Average total cost is at its minimum point. Remember that MR (price) is determined by the market for perfectly competitive firms, which means they are price takers. If something happens in this market which lowers price (example: a decrease in demand), then the MR line will shift down. To calculate profit, we need to multiply the difference between price received (MR) and average total cost (ATC) by the quantity of output. This means we are adding money in (revenue received from products) and subtracting money out (costs associated with production). This will give us a rectangular shape on the graph which will show economic profit. 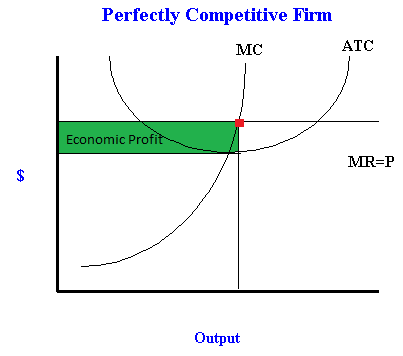 It is important to recognize that if MR>ATC (meaning the MR line is above the ATC curve) then economic profit will be positive, and if MR<ATC (meaning the MR line is below the ATC curve) then economic profit will be negative. It is also critical to remember that all firms will produce where MR=MC (except when being asked about shut down points). In the above example, firms will exit the market (shifting the supply curve left), until price again reaches its equilibrium value at the point where MC=MR=ATC shown in the first graph. Remember that to find the profit amount, you need to find the difference between MR (or P) and ATC, and multiply it by the output quantity. You always know where the firm is going to produce because it will be at the point where MR and MC cross. In the short run it is possible to make economic profits or losses because at least of the inputs is fixed, but in the long run firms are able to enter or exit the market to correct for positive or negative economic profits.